For a company to have good and impressive sales record it is very vital to have proper salespersons to market and sell the products. If the sales people in a company fail to carry out their responsibilities in a proper manner then it won’t be long before the entire company hits rock bottom and has to close down. In today’s times, hiring a good and resolute salesperson is no easy task at all. If you do not hire the right kind of person on-board, it could spell disaster for your institution. 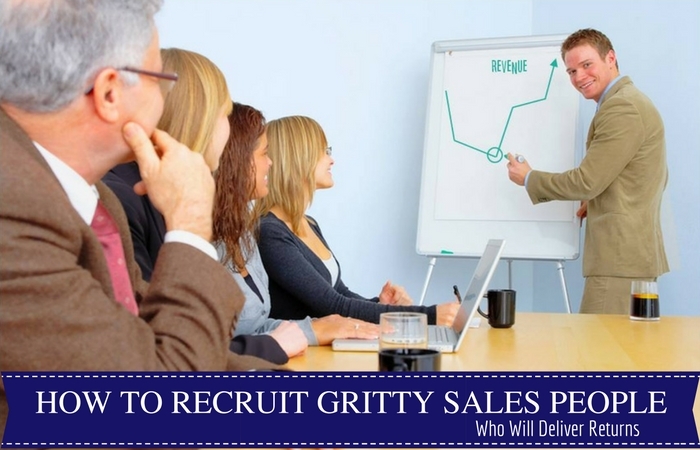 Given here are some of the main tips on recruiting sales people who will deliver dramatic returns for you. What Makes a Good Salesman? For making up a great or good salesperson, there cannot be simply be one thing which comes to your mind. There are a number of little things which makes up a good salesperson. First and foremost is that a proper education as well as a neat appearance is something which makes up a good sales man. If a salesperson is not presentable, then no one is going to respect him or even pay any attention to what he is saying at any given point in time. When speaking about a proper education, it means that a salesperson should himself have an knowledge of what it means to be a salesperson and how the entire process of sales works. A good salesperson is someone who has been properly trained so as to perform all his functions in a proper as well as satisfactory manner. Training is something which makes a good salesperson. It is impossible for a salesperson to learn everything ‘on the job’, he/she must have a proper training period where they can make their fair share of mistakes and learn the ropes of the business. A good salesperson is born, when he or she receives the right kind of guidance from a senior or someone who has been around for a long time in the business. If a salesperson fails to receive the right kind of guidance then he will never be able to do a good job. This mentor is someone who will be able to clear all the doubts and queries which the new salesperson will certainly be having in his mind. Experience is something which makes a good salesperson. It is only after trial and error that a salesperson is finally able to understand what is exactly expected from him. Experience is something which helps a great deal in making the person good at his job. A main trait of a salesperson is that he or she is able to speak in a proper as well as comprehensive manner. A salesperson is required to communicate with customers on a daily basis and if the salesperson is unable to communicate his thoughts in a proper manner, then that is going to take a toll on the companies profits. When thinking of the major traits of a salesperson. One of the first traits which comes to mind, is the eye for detail. If a salesperson does not have an eye for detail or good powers of observation, then he will never be able to perform all his duties in a successful manner Having attention to detail, is needed for two reasons, first is that all the products can be placed in a proper and presentable manner and second is that he can recognize the customers with buying potentials opposed to those who are just there to browse through things and spend their time. Salespersons are always expected to be friendly, however at no point in time should they be over friendly with the customers who have entered the store to make a purchase of any kind. There is certainly a line which separates the customers from the salesperson and that line must never be crossed. So a good salesperson is someone who has the trait of being friendly but at the same time knows where to draw the line. A major trait of a good salesperson is that he is someone who is rather smooth. Smooth not merely in his manner of talking, but smooth in terms of how he moves. Good sales people have a good body language. At no point in time are they sluggish in the manner in which they walk or move. As it has been stated above, good sales people are friendly, but that does not mean that they are silly. Despite being very friendly and kind, they are also excellent at negotiating. At all points in time, their chief aim is always to make the sale for the company. When recruiting a salesperson you have to be on the lookout for a number of characteristics. If a candidate fails to have most of the characteristics then he is obviously not suited for the job. A chief characteristics to be on the lookout for, is to see whether the candidate is someone who loses his cool at the drop of a hat or whether he manages to stay cool even under the most tiring circumstances. A good and successful salesperson is someone who is always cool and never raises his or her voice at any point in time. If you hire someone who shouts and screams a lot, then that will surely scare off the customers and bring a bad name to your dear company. An important characteristic of a successful salesperson is that he should be great at multi tasking. Multitasking is the ability to handle a number of tasks simultaneously. If the salesperson is unable to look into a number of things at the same time, then that is bound to affect your company in more than one way. Being great at multi tasking is something which not many people are born with, but luckily it is something that can be acquired without much difficulty at all. Finding multitaskers is not an easy task at all, but once you have found one, be sure to hire him/her on-board immediately. Else you might regret it at a later point in time. A main characteristic of a successful salesperson is that he/she is always well informed. Well informed, not only about the products of the company, but also about the values and the beliefs which the company as a whole represents. If the salespersons in a company or in a shop are not well informed, then that leaves a very bad impression in the minds of those customers who walk in to the company and ask questions which have been plaguing their mind. A salesperson, might not have answers to all the complex questions which are being asked, but he should at least have basic knowledge and information. Contrary to popular belief, salespersons receive a handsome salary, especially if they are a part of top companies. Big companies are well aware of how vital it is to keep the salespersons happy and that is why they furnish them with a proper salary so that they are not dissatisfied at any point or under any circumstances. If salespersons are not paid well, they in turn will not work their best to ensure that the company reaches new heights. In addition to this, with each passing year, the salary of the salespersons usually increases, especially if the company is very happy with their work output, dedication as well as commitment. In addition to getting a good salary, it is also important to note that salespersons also receive several other benefits as well as perks. These perks can be in a number of forms, whether in cash or even in the form of coupons. Such perks serve as incentives which encourage the employees to give their best under all circumstances. Though salespersons are amply rewarded, it is important to note that they don’t get paid a lot for doing nothing at all, they work very hard and only then receive the rewards which are due to them. If they fail to perform well, then they will not receive any such perks or benefits. How to Recruit Great Sales People? To recruit great sales people to your company or establishment, it is imperative that first and foremost you understand and get a grasp of what exactly is the need of you company. If you do not understand what your company stands for and represents, then you will never be able to recruit the perfect salesperson on-board. In today’s time, there is plenty of talent out there so ensure that you only recruit the best of the best. Ensure that the interview process is long and tough so that only the best of the best come shining forth. Do not hire someone who you are unsure of, as that could put you through a lot of problems. To recruit a good salesperson on your team, it is essential that you conduct a proper test to see whether this person is good enough to be hired on-board or not. Having a verbal interview is simply not good enough, to really test the candidate, conducting a written as well as a practical exam is necessary. Finding a good salesperson is not an easy job at all, so ensure that you are willing to take up the challenge. There will be many people who will come forward and apply for the job, but it is mandatory that you keep an eye out for those who are good, rather than hiring mediocre candidates. There are many companies which underestimates the value of a salesperson and that is why they never pay much attention when hiring a salesperson. If you make this mistake when recruiting a salesperson, you will certainly regret this. To hire a proper salesperson, you yourself must be well informed about what makes up a good salesperson and what characteristics and traits you should be on the lookout for. If you hire someone who is not good at the job, then the company is bound to suffer in a number of ways. Make your choice very carefully and you will not regret your decision in time to come. These are some of the traits and characteristics which you should be on the lookout for when you are going to hire a salesperson. A salesperson is someone who should have an array of positive attributes. He or she cannot just be good in one thing or the other. It is rather unfortunate that only in recent times, that companies have understood just what an important role of salespersons play in any company. If the salespersons are unconcerned and unwilling to do their job well, then nothing can save the company. It is for this reason that higher authorities in the company should do as much as they can to keep these salespersons happy and content.